I found Alice Sprintzen through Ganoksin’s Orchid Gallery which by the way, has just been overhauled. Orchid is certainly the most valuable forum site in our industry and now it’s even better with new bells and whistles! I may have developed my approach to jewelry design back in childhood when I accompanied my parents beach combing. I have always enjoyed the hunt. There is something around every corner that cries out for fresh consideration – a new context in which to reinvent the ordinary, making it extraordinary – be it in the realm of the mind or the work of the hands. I work primarily with found objects. It is a challenge to combine materials without using heat (which would destroy most found objects). Cold connections, including riveting, sewing, lashing and wrapping are the methods I most often employ to connect found objects to one another and to metal. I use traditional jewelry making techniques for the parts of my works that can be soldered, hammered, etc. It is also a challenge to harvest the “found” materials. For example, I have driven from one body shop to another in search of car tail lights in the disposal pile, sometimes being rewarded with large chunks of cars from which I had to extract the plastic. Car plastic is much stronger than I had imagined and takes the great force of a hammer to break into workable pieces. It is actually a rather dangerous process and one has to take care not to get cut. My jewelry is, by its nature, a statement about society. It is, by implication, pro-reuse, and anti-consumption. It elevates ordinary materials to diamond status – at least that is the challenge. It is about finding beauty and humor in the ordinary. It is important to work hard for just causes but it is also important and soul saving to do it with a sense of humor. I wear my own jewelry most of the time and people seem to derive pleasure from it. It provokes a variety of reactions – most accompanied by a chuckle. I’m repeating myself, but in my opinion, humor is a “must” for dealing with the challenges of life. People also connect to specific objects in a piece, which may conjure up a memory, or evoke a metaphor that resonates with their own experience. I am also the lucky recipient of numerous “goodie bags” presented to me by friends who know that there is no better gift than a good rusty found object. They are joining me in the search and I feel they are part of the process of my work. I enjoy surprising them at that moment of recognition when they notice their contribution in a completed piece. I first came to jewelry design as a child, weaving beads on a cigar box loom, creating little people in tiny beads. The world of creating objects has always been an integral part of my life. As an adult, I majored in sculpture in art school, feeling more in tune with three-dimensional materials and techniques to get my ideas across than with the required two-dimensional studies. The school that I attended did not offer jewelry making. If it had, I’m quite certain that I would have been drawn to it like a magnet. I love to manipulate materials and especially appreciate the resistance, technical challenges and personality that each material/object brings to the table. Teaching art has been my career and jewelry making my passion. I taught high school art for many years and presently teach jewelry making to adults at the Art League of Long Island in Dix Hills, New York. It makes for a good balance. I have also authored three books and, although writing initially did not come easily to me, I found that, with practice, it was enjoyable to share my technical expertise with others. Being a teacher, I had a wealth of projects and techniques at my fingertips and was used to explaining processes in complete and easily understood detail. By my third book, I sailed along smoothly, no longer having to struggle with the words. It was important for me to create projects that encouraged an individual approach so that each reader’s work emerged from his/her own unique vision. It was also important that the examples illustrating the books be of the highest quality of craftsmanship as well as creativity. I especially enjoyed visiting the studios of the artists and seeing their work in person. It intrigued me how they each arranged their workspace and how they employed different techniques to create the effects they were going after. I learned a great deal in the process. To fledgling jewelry designers, I advise working from your own vision. If you don’t have a strong one as yet, keep traveling in new directions and keep an open mind. Follow your ideas even if you have no notion of where they will take you. Don’t take the safe route and work in inexpensive materials so that you can throw out what isn’t working without loosing a night’s sleep. What fun it was to spend time viewing Alice’s work and learning more about where it comes from–physically and mentally–look for her name to become “a name” very soon, I am quite sure! 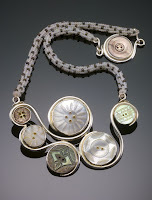 Previous post: Keith Lewis: Joyful Jewelry! Next post: Tammy Kirks: Modern Granulation and Pop Enamels!